It's been over 10 years ago since I've lived in Coquitlam. It is very different since then, with many residential developments sprouting up. The area around Ioco Road and Guildford Way has changed dramatically. Once a vast area of nothingness, now rests Newport Village. I swear, if you put this complex in Downtown, it would fit right in. Modern, trendy and full of services, I can see why this place is so popular. So where you find services, you'll also find restaurants. However, many if not all of them are hidden from the street. Last time I was in the area, Pomegranate and I paid a visit to St. James's Well. Pretty decent eats. I wouldn't have even known it had existed if no one told me about it. This would be the same for Sango. Located in the development kitty-corner to Newport Village, it is completely hidden from plain view. You need to drive into Brew Lane towards the Thrifty Foods to find it. Both Polka King and Rich Guy have eaten here, resulting in 2 thumbs up. In that case, it was a matter of time that I made my way out to give it a try. And that I did, with the family and meeting up with Rich Guy once again. Does this guy do anything but eat? Wait. That would be me as well. Nevermind. Now, the thing that worried me about the place is the "fusion" part. I'm not against it per se. It's just that fusion usually implies "more expensive" and possibly "not very good". But I'm always game about giving everything a chance. Walking into the place, it sure had style and one look at the menu - yup, it's somewhat pricey. All that remains is whether the food stacks up or not. We decided to try a few of their specialty rolls starting with the Hot Night. 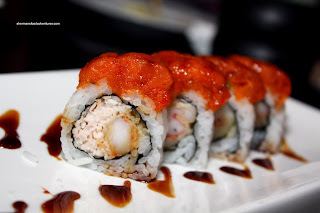 Essentially a dynamite roll with spicy braised tuna on top, this was pretty pede strian. The rice was decent having some bite (a bit bland though); but the roll was not as flavourful as I would've hoped. The Red Dragon was the prototypical blank canvas (California Roll) with something on top. 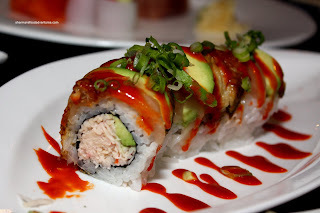 The something was a combination of tuna, unagi and avocado with a spicy sour sauce. I found this one much more flavourful and interesting. Some nice flavours going on with the tuna, unagi and the sauce. 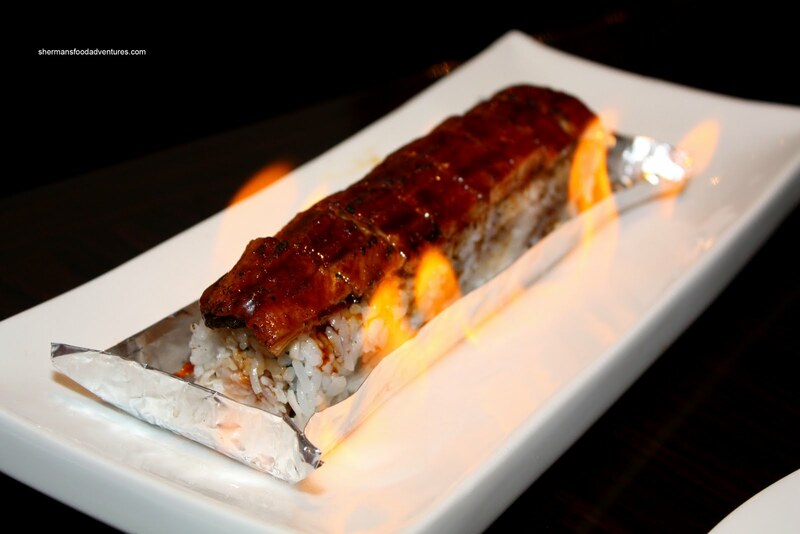 For nothing more than plain curiosity or stupidity, we got an Blazing Unagi Roll for $15.95! Turns out it was nothing more than a California Roll with unagi on top plated on aluminum foil. Only the plate underneath it was set ablaze. Don't get me wrong, it was actually a good roll with a large piece of unagi on top. Just incredibly pricey. Now for an item in the "fusion" section - the Italian Red Snapper. It's sliced thin and drowned (or drewned as stated in the menu) in EVOO and balsamic vinegar with green onions and fried garlic slices. I can't deny that this was not bad; however, I much prefer the one from Sushiyama. Somehow the flavours were a bit muted and it could've u sed much more garlic. Naturally, at any Japanese restaurant, it would be a good idea to try the sashimi. 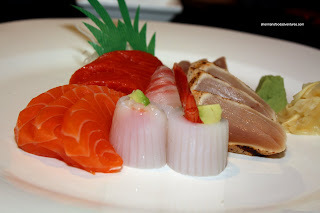 Hence, we ordered the Assorted Sashimi consisting of salmon, ika with ebi, tai, tuna tataki and wild salmon. Once again, I have to say it was pretty good. Nicely cut and presented, it was both fresh and texturally pleasant. The only thing we didn't like was the portion size, it was quite small. 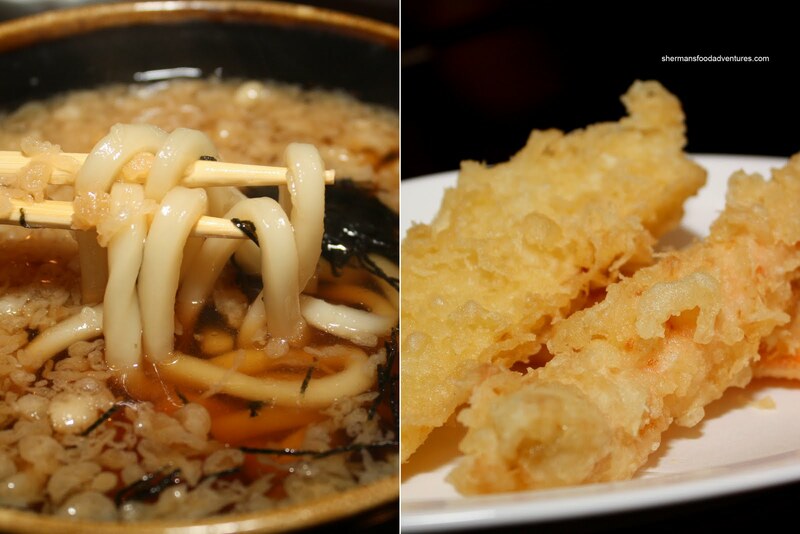 By default, we got the Tempura Udon for the kiddies. Not something I would choose to order; but that's what the kiddies want and that's what they'll get. I found the udon noodles to be on the softer side. Just a bit though. 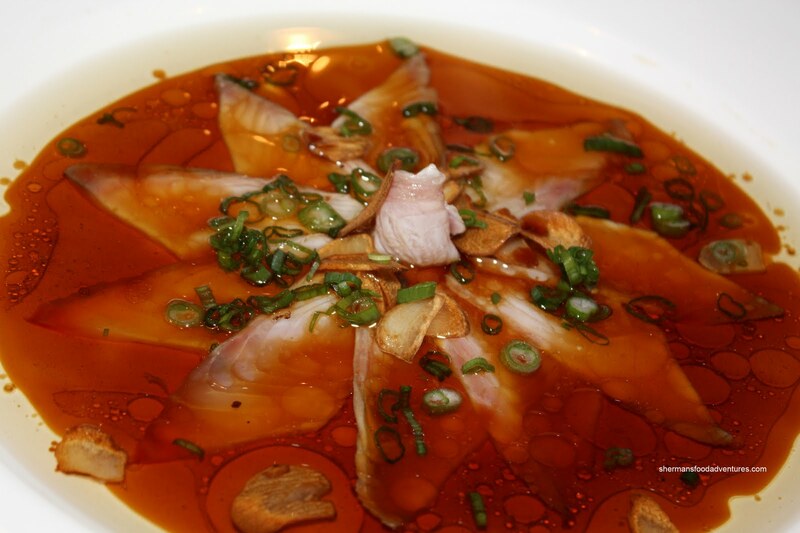 As for the broth, it was very flavourful. Maybe too flavourful. It was intensely sweet with a touch of saltiness. I was extremely thirsty after dinner. Not completely sure as to the cause; but you can make your own conclusions. The tempura consisted of only 3 pieces - one each of ebi, carrot and sweet potato. It was sure crispy; but the batter was too thick. I really couldn't believe the udon set us back $11.00. For that price, I could go to Chef Hung or Hakkaido Ramen Santouka for a bowl of noodles. At this point, we were not completely full and decided to tack on 2 appies. 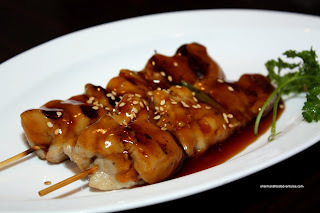 The first one was t he Chicken Yakitori. Nothing particularly interesting with it considering it is 2 skewers of chicken meat with teriyaki sauce. However, it was decently tender and not too salty despite the abundance of sauce. 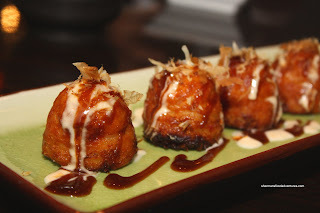 Secondly, we got the Takoyaki. Normally, these are pan-grilled in a takoyaki mold; yet many places do the quick way by deep-frying them. As expected, these were deep fried. Decently fluffy inside and slightly crispy outside, I didn't mind them. I thought there was just enough unagi sauce and mayo for flavour while I could've used more bonito. 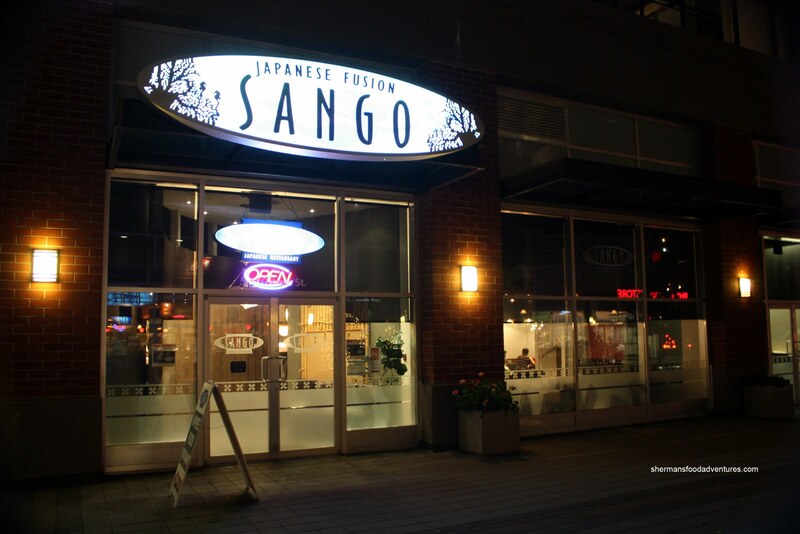 If I had to sum up Sango in one word, it would be expensive. The food itself wasn't bad considering the location. Nothing spectacular; yet nothing horrible either. The ambiance and decor are quite pleasing while the service can be a bit slow (although it wasn't rude as some people have remarked). However, I can't get over the pricing. It is dangerously close to Miku prices and Sango is no Miku. Furthermore, it is not located in Downtown, so I'm not exactly sure where the premium pricing comes from. At the very least, the fusion part doesn't necessarily detract from the final product. Unfortunately it does reaffirm the stigma of a fusion restaurant - $$$. Hey Sherman, if you're looking for exceptional sushi i recommend sushi shelter in port coquitlam. i dont know if you have heard of them but it's right behind save on foods by costco, all the food is amazing! from their sashimi salads to their desserts. everything is fresh and the prices are well worth it! Thanks for the tip. Hopefully I can make it out sometime.